The initial idea for Schoology came about during college when three friends, Jeremy Friedman, Ryan Hwang and Tim Trinidad tried to develop an effective platform for sharing lecture notes with everyone in the class. After two weeks of development, the project gained traction, but not in higher education; rather, K-12 students began actively using the service and teachers began reaching out. “It got us thinking,” says Jeremy. “The learning management system that our university relied upon handled the basics just fine, but missed so many opportunities to be a more collaborative and more effective tool for both professors and students,” he says. In K-12, the problem was even larger, since most schools didn’t even have learning management platforms. “Why not create a platform for K-12 that looks and feels like the tools people use outside the classroom, but contains the functionality of a learning platform?” Jeremy asked. “Better yet, why not provide a platform that could be implemented in a single classroom with teachers and students, or implemented on a school-wide basis without any cost or friction?” Great questions, and with those, the next thing they knew, Jeremy and his co-founders set out to make the vision a reality. Jeremy: In the Greek language, the “logy” suffix is used to identify core knowledge about a specific theme—sociology, theology, etc. And the word “school” is an instantly recognizable term for any place of learning, whether it’s a traditional elementary school classroom, a virtual university, or even a cooking school. So, what better name to use for a collaborative platform that excels in learning than “Schoology”? 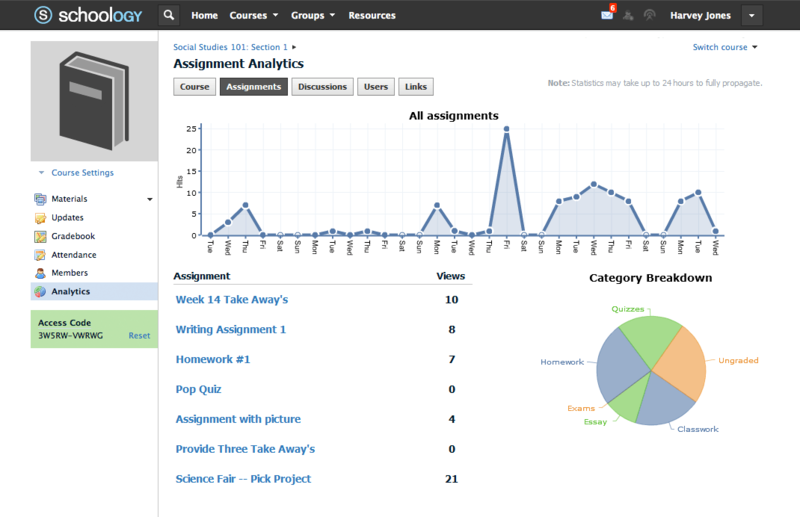 Jeremy: Schoology is a collaborative learning platform, combining the course content and functionality of traditional learning management systems with the immediacy, access, and connectivity of social networking tools. Schoology was started by four people; I was one of them. Ryan Hwang and Tim Trinidad, who I knew from college (Washington University in St. Louis), and Bill Kindler, who I knew from home. Victor: The layout looks familiar. What does it do and what are the benefits? Jeremy: Schoology allows teachers to securely and efficiently conduct tests and quizzes, host discussions about course materials, provide supplemental insights on daily lessons via blogging, offer one-to-one feedback on assignments, assign and collect homework, and expand in-class learning by sharing supplemental content and linking to additional reference materials. It also provides a safe and secure area for students to communicate and collaborate. As the platform is cloud-based, it essentially renders the three o’clock dismissal bell obsolete in terms of access to learning. All students and teachers need is a computer with an Internet connection. By upgrading to the enterprise level version of Schoology, school and district administrators gain access to customizable system settings, permission controls, and branding features. Equally important, the enterprise version offers the ability to migrate individual teachers from their solitary Schoology platforms to one singular, shared one that opens a window for across-the-board performance reporting and analytics. And since Schoology is cloud-based, it’s completely online. There’s no software to install, no extra equipment, and no maintenance required. It’s safe, secure, private and protected. Its layout resembles the look of popular social media tools, so it’s comfortable and familiar—and easy for technology novices to quickly learn and use. The greatest benefit to Schoology is the stronger connections and collaboration it fosters among teachers and students—and their parents. By enabling parents to sign up, too, Schoology encourages more frequent communication with their child’s teacher, ultimately boosting parental engagement in the learning process, a critical component of every student’s success. Jeremy: There are many, many education technologies available that address specific needs within the learning marketplace, including some that overlap with bits of what Schoology offers. The vast majority, however, aren’t hitting the mark with respect to what educators and students need in terms of accessibility, integration, and basic functionality. They simply aren’t keeping pace with innovation. Early products were developed with just the administrator in mind, making them clunky and difficult to use. More recently, a number of companies have emerged with solutions that focus solely on niches, such as teachers, students, or parents. Schoology is unique in understanding the need to create a product that is fun, familiar, and easy-to-use for students, teachers, and parents alike. Equally important, it provides specific features that administrators say matter most, such as critical third-party technology integration, scalability, and enterprise-level controls, data reporting and customization. Jeremy: We began working on developing Schoology after college graduation in May 2009, with the first marketable platform launched in September 2010. Jeremy: Individual teachers, students, and parents can use Schoology on their own—at no cost—with the full suite of course content, third-party program and service compatibility, and social networking functionality that teachers want to boost student engagement and spark their intellectual curiosity. The premium analytics, reporting functionality, and customizable configuration that appeal to school and district administrators are offered through our fee-based enterprise-level solution. Jeremy: Teachers across the U.S. and as far away as Malaysia use Schoology in countless ways every day to connect not only with their own students, but also those in other classrooms by working with other teachers on shared learning projects. It’s helping to power more than 60,000 courses and delivering more than 150 tests and quizzes an hour. Jeremy: Schoology is a platform that helps people teach and learn more effectively and efficiently. One of its greatest advantages is its flexibility in terms of the context in which that learning takes place. Although we are focusing our marketing efforts right now on the K-12 space, Schoology is equally suitable for—and is being successfully used by—colleges and universities, virtual schools, and even corporate users like Groupon who need a reliable, accessible vehicle for delivering uniform training to its geographically dispersed workforce. As long as you believe in the meaningful role that technology can and should play in reforming the outdated classroom-only, 9-to-3 traditional approach to learning, Schoology is the platform for you. Jeremy: Clearly, everyone at Schoology shares the vision that there is a meaningful, beneficial role for technology in the classroom, and that there is a need to reshape, reform, and renew outdated teaching approaches that are no longer aligned with the reality of the way students—people of all ages, actually—learn today. It’s not just occurring in the classroom, and certainly not solely between the hours of 9:00 and 3:00. Technologies like Schoology that allow for anytime, anywhere learning and instruction reflect this paradigm shift and rightfully so. Victor: What sort of formative experiences in your own education helped to inform your approach to creating Schoology? Jeremy: As I mentioned before, the idea for Schoology truly came out of a very personal education experience for its founders—our growing frustration with the LMS our college was using! We had been a user of these systems from both the student side, as well as the teacher side when acting as a Teaching Assistance for college courses. After a lot of “Wouldn’t it be great if it would allow us to…”-type conversations, we decided to just do it. We set out to make a better product and succeeded. Victor: How does Schoology address some of your concerns about education? Jeremy: Educators know that it takes more than lessons on “reading, ‘riting, and ‘rithmetic” to give students the well-rounded, practical education they need to thrive and be successful. The world has evolved and will continue to do so, and modern educational theory and practice has to keep up. That includes not only what we teach, but how we teach it. As I said earlier, even though K-12 education is still formally blocked out in most districts for weekdays between 9-3 pm, students’ learning cannot be similarly contained. Thanks to the Internet and the ubiquity of cellphones, laptops, PDAs, and the like that enable people to access unprecedented amounts of information within seconds. The education sector shouldn’t ignore that fundamental reality. Instead, they need to harness these innovations and leverage ways to capitalize on the opportunities technology presents. Schoology does exactly that. Victor: Your take on the future of education? Jeremy: It’s very, very positive. We speak to educators all the time and are continually amazed by the creative ways that they have welcomed technology into their classrooms and the stellar performance that they are getting as a result from their students. It is clear that our vision for enhancing the learning process through the adoption of innovative technologies that fuel greater engagement, collaboration, and communication among teachers, students, and parents is very widely shared. Victor: Got any quirky stories? Jeremy: I’m not sure if quirky, but the one thing we find amusing is how frequently people mispronounce “Schoology” as “School-ology”…a name we had considered but discarded in the beginning as too much of a mouthful! When people ask though, we tell them that we don’t care how they say it, as long as they spell it right in the browser. Congratulation guys. Schoology is a great .